Capable of flying for 12 hours a day and travelling across oceans and continents, Boeing’s BBJ1 is a truly luxurious workhorse aircraft. A BBJ1 is a fantastic aircraft and there are few better ways to travel. As well as offering true luxury, the BBJ1’s ability to carry more than 50 people makes it an incredibly practical aircraft for corporates. This is a big aircraft and so are the costs of operating it. If you desire ultra-long-range, you might want to look at smaller (but still very large); if range is not so important to you, you might want to consider the cheaper Embraer Lineage. The market for airliners is very small, so do not expect to sell one quickly – or to recoup the money that you invested in the aircraft’s interior. The Boeing Business Jet (also known as the BBJ1) is the business jet variant of the Boeing 737-700. Low cost carriers regularly carry 149 passengers in a 737-700, but BBJs carry a lot less passengers in a lot more comfort. A BBJ1 is capable of flying for 12 hours and can reach speeds of 541 mph. With eight passengers and four flight and cabin crew, the BBJ has a range of over 6,200 nautical miles. With 50 passengers and four aircraft crew, the range is 5,360 nautical miles. The take-off distance for a 6,000 nautical miles flight is 5,775 ft and the aircraft has a certified ceiling of 41,000 ft. The passenger cabin of a BBJ1 measures 79 ft (24.04 m), 7 ft high and almost 12 ft wide. With so much space, the BBJ1 is an interior designer’s dream and can be configured almost in any way imaginable, but it is usually divided into four main cabin areas; a boardroom, a lounge, a VIP bedroom, a business office and two restrooms with showers. In a higher density configuration – carrying up to 60 passengers – the BBJ1 is a popular choice for governments and corporates. Even with this many passengers, there is still room for a state room and a bedroom. 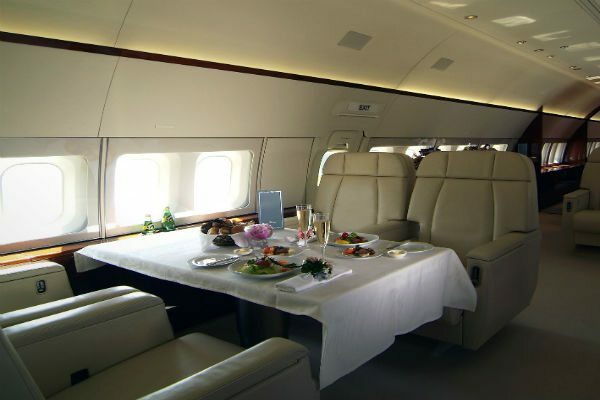 BBJs that are owned by private individuals – which account for around half of all BBJ orders – typically have a more luxurious configuration and are designed to take around 20 passengers. There is plenty of scope for many different interior options and seating layouts, with extra wide seats capable of being used for sleeping during long haul flights. The aircraft can be fitted with a specially designed galley or with a standard one fitted to all commercial versions of the aircraft. The interior of a BBJ1. A BBJ1 has a list price of $57 million, but this does not include the interior which typically cost the owner an extra $20-25 million. There are 17 aircraft completions centres across the world, which have all been authorised by Boeing. Once a customer has selected their preferred centre, Boeing delivers a green – or unfinished – jet, where it can then take between 12 and 18 months before it is delivered to the customer. At ABACE 2014, Boeing revealed that it had delivered 152 BBJs in total. 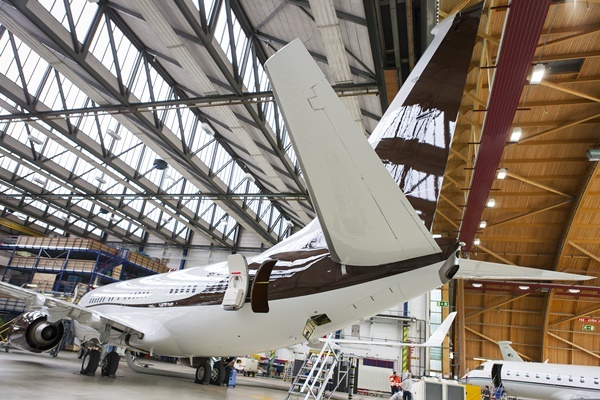 The Middle-East and North America account for almost 60 per cent of total orders, while Europe and the Asia Pacific region are both responsible for roughly a fifth of all BBJ orders. Corporate airliners are a niche market and values were hit during the 2008 downturn. Only a small group of buyers can afford a BBJ (and some of these only want a brand new aircraft), so the resale market is very limited.